We have a desk area in our kitchen with a long drawer that was a hot mess. I couldn’t find anything in there. Tape measures. To-go menus. Pictures. Birthday cards. Chapstick. Air fresheners. Stuff I had no idea what purpose it served. 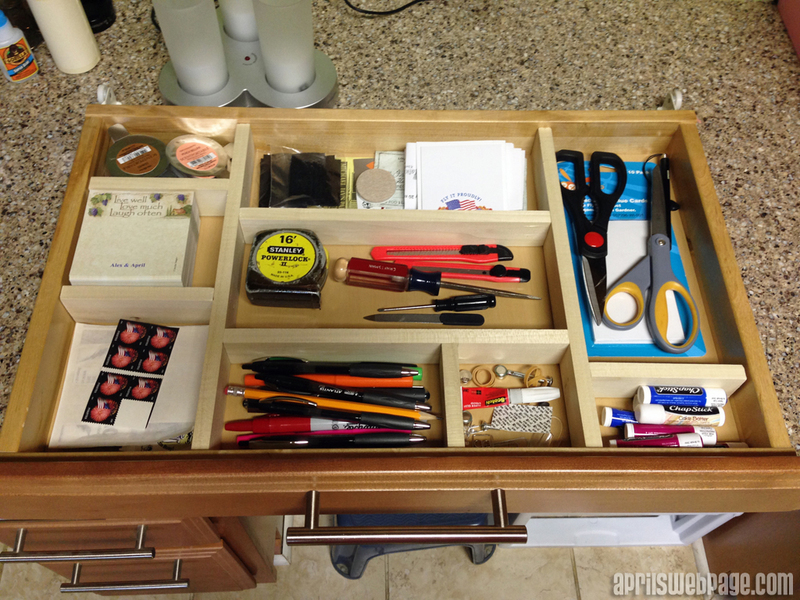 To practice more of my woodworking skills, I decided to do a basic drawer divider and found a fairly easy plan on Ana White’s website. I completely forgot to take a “before” picture to show just has chaotic the drawer had become. First, I cleaned out the drawer and laid out the items I would be putting back into the drawer so I could figure out what measurements to use for each section. Yes, we really need that many things of Chapstick because Alex has a bad habit up leaving them in his pants pockets and in the washer they go! Ana’s website plans call for boards that are 1 x 3. My drawer depth was only about 1 5/8″, so I opted for ½” x 2″ poplar hobby boards at Home Depot. I prefer using the hobby boards rather than buying a long 4-6′ board because at least the hobby boards are stored flat, so they are usually straight. The longer boards are stood up for storage, and they warp. And let me tell you, trying to build something with warped wood is frustrating to say the least. The actual measurements for the boards I used were a tad under ½” x 1.5″, so it was perfect for the depth of my drawer. I used my new Ryobi airstrike cordless brad nailer to assemble it. I LOVE the brad nailer! It makes a lot of things so much easier to do now. I’m still working on precision though, since there were a few times I missed, and the nail went through the wood the wrong way. With this drawer organizer, I did not attach a bottom. Here it is after all the pieces are together. It’s not attached to the drawer itself, so if I want to make a different one in the future, I won’t have to rip this one out. And here it is with all of the junk drawer items in place! 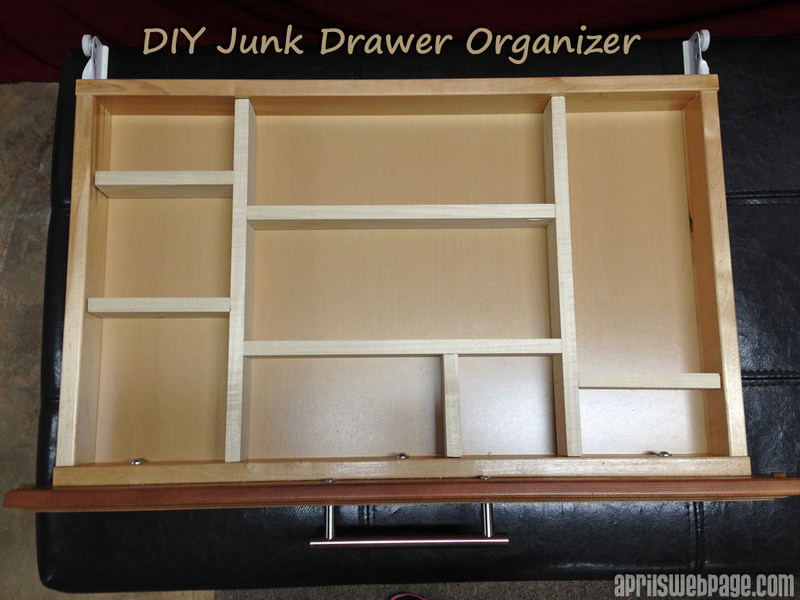 I’m happy to say that 5 months after doing this organizer, the drawer is still nice and neat! 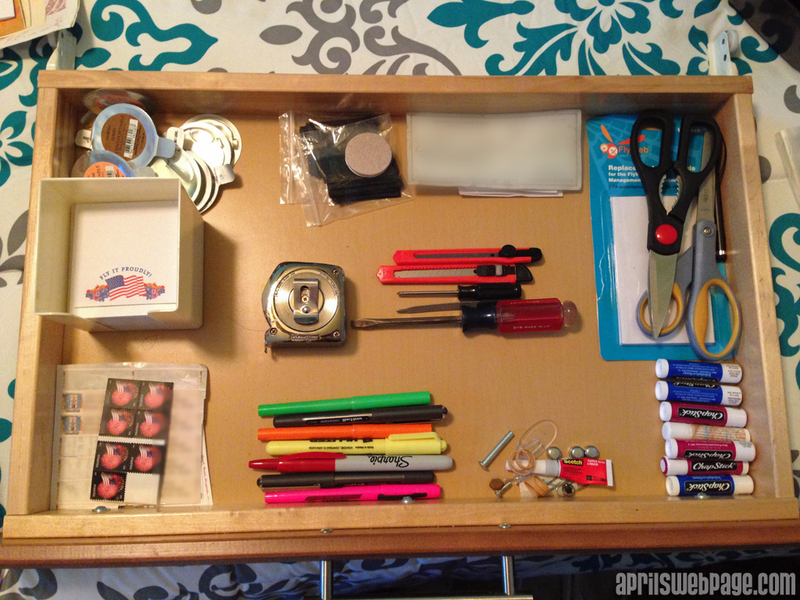 This drawer organizer turned out so much better than my first attempt with my desk drawer multi-level organizer, which I will one day re-do!